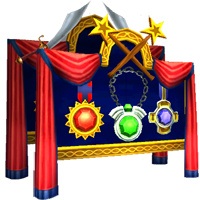 To honor all those who have served their countries, KI is giving away a memorial Medal Display housing decoration in both Wizard101 and Pirate101. From now until midnight US Central Time on Nov 11th you can click the link and log in to get your Veteran’s Day memorial housing item. Once you have claimed your gift, see How To Redeem A Gift. I’ll send your thanks onto KingsIsle.